Kuala Lumpur, 7 September 2018 – As the Oil & Gas industry worldwide continues its slow recovery with upstream companies increasing production, the midstream and services businesses in Malaysia and the region are expected to benefit from the recovery and play a pivotal role in catalysing regional industry growth. For some 350 Oil & Gas service providers, the upcoming 4th Malaysian Oil & Gas Services Exhibition and Conference 2018 (MOGSEC 2018) in Kuala Lumpur, will provide the opportune platform to not only showcase their latest technology, equipment and machinery in the fields of Oil, Gas and Petrochemical Engineering but also provide possible collaborations and partnership opportunities with other players locally or regionally, in terms of technologies, integrated solutions, quality talent or export capabilities. Scheduled from 25 – 27 September 2018 at the Kuala Lumpur Convention Centre, the notable exhibitors include top stakeholder PETRONAS, and major players including Bureau Veritas, Draeger, Geveke Oil & Gas, MMC Oil & Gas Engineering, Sapura Energy Berhad and Velesto Energy Berhad as well as the Malaysian Oil & Gas Services Council (MOGSC) SME Pavilion and Sabah & Sarawak Pavilions, amongst others. Tan Sri Wan Zulkiflee Wan Ariffin, President and Group Chief Executive Officer of PETRONAS is scheduled to officiate the opening ceremony of MOGSEC 2018 on 25 September 2018. 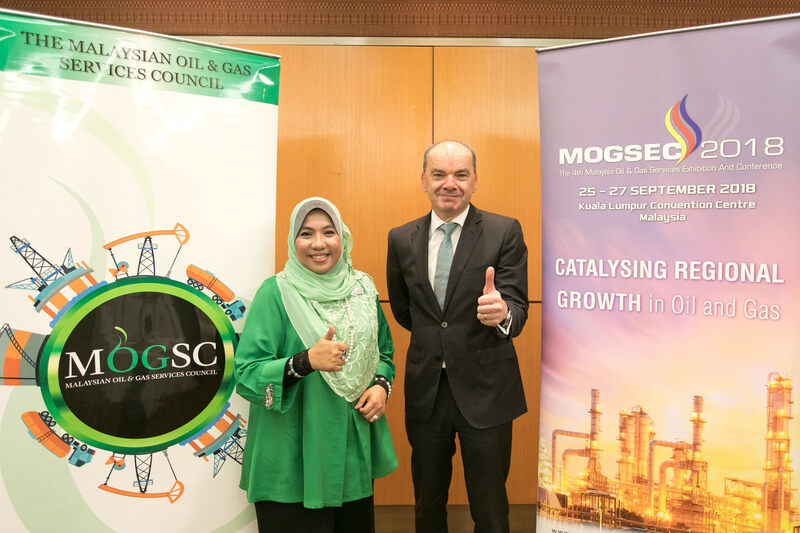 Said Puan Sharifah Zaida Nurlisha, President of the Malaysian Oil & Gas Services Council (MOGSC), “Malaysia continues to be one of the fastest growing economies in the Asia Pacific region, and our Oil & Gas sector has created plenty of opportunities for businesses in the O&G services sector. In order to maintain its projected annual growth rate of 5% until 2020, the industry has invested heavily into enhancing the output of existing Oil & Gas fields as well as new marginal fields, while also enhancing the exploration and development of deepwater areas. “In this climate, Malaysia’s Oil & Gas Services and Equipment (OGSE) companies must continue to maintain their momentum and increase their competitiveness, as there are many opportunities just around the corner. This is one of the primary reasons why we established the MOGSEC platform. This year’s theme, “Catalysing Regional Growth in Oil and Gas”, signifies the need for Malaysian OGSE players to actively explore and develop synergistic partnerships and collaborations across the value chain, both locally and internationally, to further stimulate the Oil & Gas industry in Malaysia;” added Pn Sharifah. According to Mr Alun Jones, Country General Manager of UBM Malaysia, the organiser of MOGSEC 2018, the upcoming event will not only showcase Malaysia as a regional Oil & Gas hub and the expertise of local Oil & Gas service providers, it will also highlight industry best practices and open up numerous business opportunities. “MOGSEC 2018 is expected to welcome about 7,000 trade visitors who will make their way here to forge new business leads and strengthen business partnerships, in the hopes of growing and strengthening their business operations and service offerings here in Malaysia. This will undoubtedly drive more foreign investments into Malaysia and invigorate the local O&G economy. The event will also successfully draw local and foreign visitors into the capital city, thus generating positive ripple effects for tourism and hospitality sectors before, during and after the show,” said Alun Jones. The special features of MOGSEC 2018 include the MOGSEC Innovation Centres, the MOGSC Innovation Awards, MATRADE International Sourcing Programme, MATRADE Incoming Buying Mission, MIDA Business Clinic, International Delegation Programme, among others. MOGSEC 2018 is open to professionals, trade and business visitors related to the Oil, Gas & Petrochemical industry only. The opening hours on 25 & 26 September 2018 are from 10.00 am to 6.00 pm while on 27 September 2018 it will be from 10.00 am to 5.00 pm. MOGSEC 2018 is supported by MATRADE, MIDA, MPRC, MYCEB, CIDB, BMCC, SHELL and TM – the digital enablers of the show. Sponsors include Sapura Energy Berhad and Serba Dinamik.